*This post is in collaboration with Parmesan.com. They provided the cheese, and all the content is my own. Holidays always make me think of baked goods, whether it is Christmas cookies, a fresh baked french bread with a cheese spread or Thanksgiving rolls. I typically love a good traditional roll for Thanksgiving, but am not above trying out a new exciting roll recipe, to spice things up a bit. 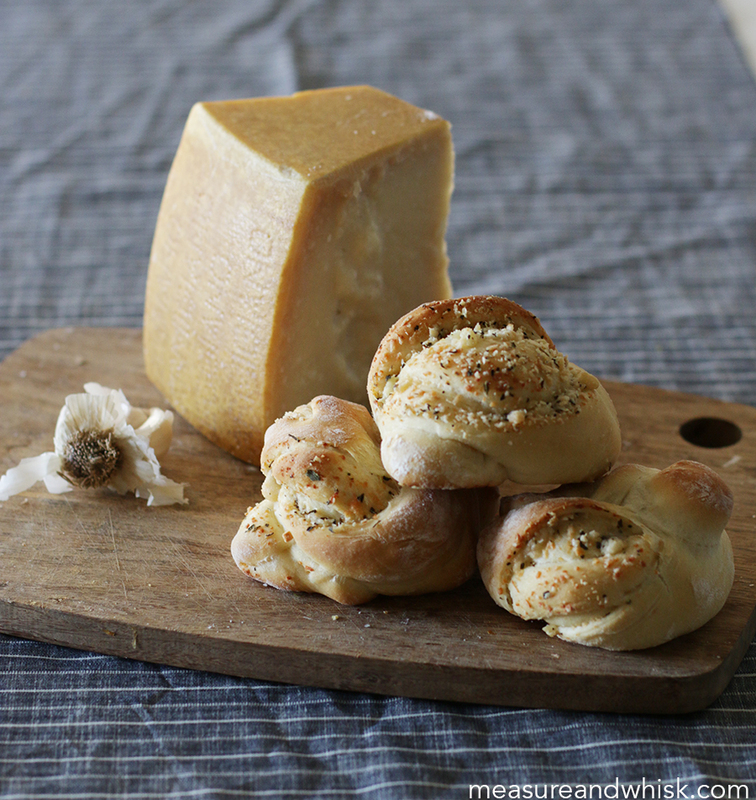 This parmesan garlic knot recipe proved just the right amount of garlicky goodness with some crispy cheese to add a little something extra. 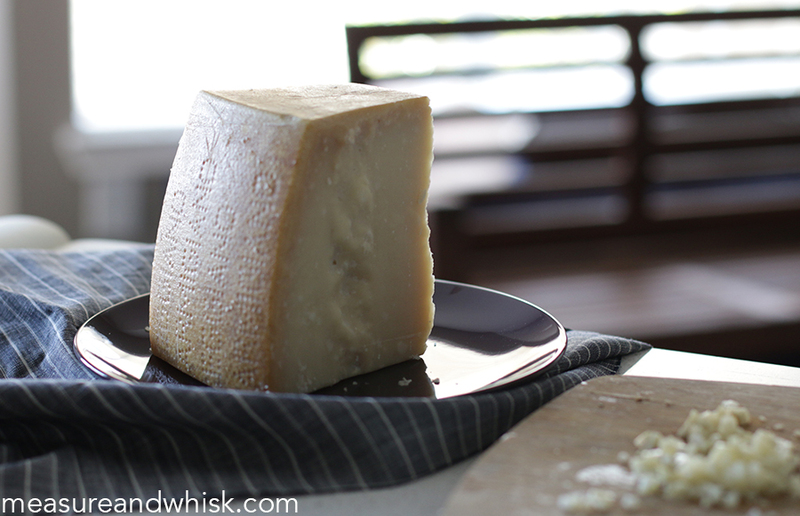 This Parmigiano Reggiano cheese is just so good. It does amazing things in these rolls. There are few things that taste as good as a high quality cheese. I had someone comment on an Instagram post about where they could find the real parmesan (as opposed to the powdered stuff, which incidentally gives me the willies). Although, I have never been able to find a block this big at my grocery store (I did see an enormous wheel at a grocery store in CA), I have always been able to buy smaller blocks in the specialty cheese section at my grocery store. There is a very good chance your store sells it to, so if you can't find it, try asking anyone who works in the deli or cheese section at your store where to find real Parmesan, they should be able to point you in the right direction. 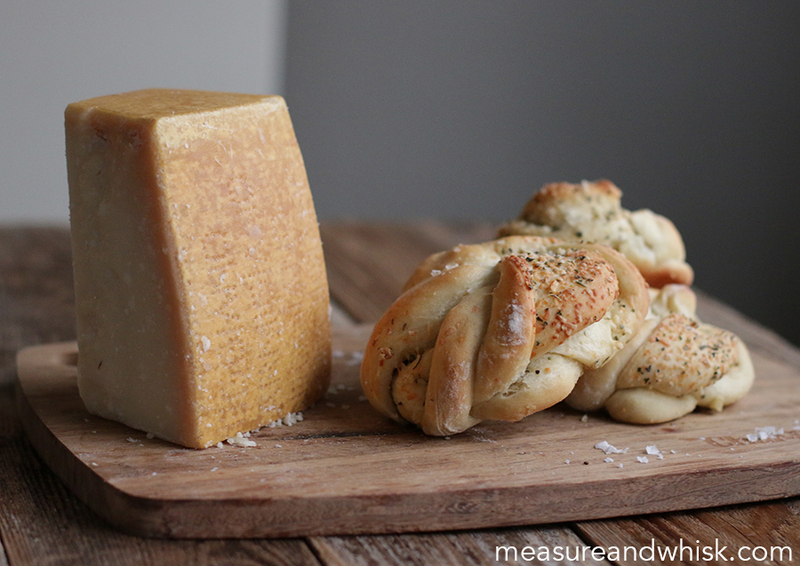 You just can't go wrong with a great roll that is filled with a great cheese. *If you make these for Thanksgiving, I would love to see them! 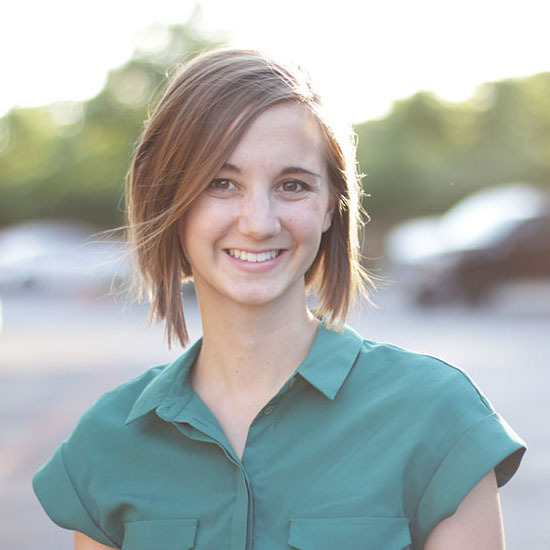 Tag me on social media using @measureandwhisk. In a large bowl, combine the yeast, warm water and a pinch of sugar. Let stand for 10 minutes, until the yeast is puffy. Add the salt, oil, eggs and 2 cups of the flour, and mix until a shaggy dough forms. Continue to add the flour until you have a soft dough that is no longer sticky. Place the dough in a clean, greased bowl, cover it with a damp towel or plastic wrap, and let it rise for 45 minutes, or until the dough has doubled in size. While you are waiting for the dough to rise, make the filling. Grease two baking sheets or get out two silicone mats. 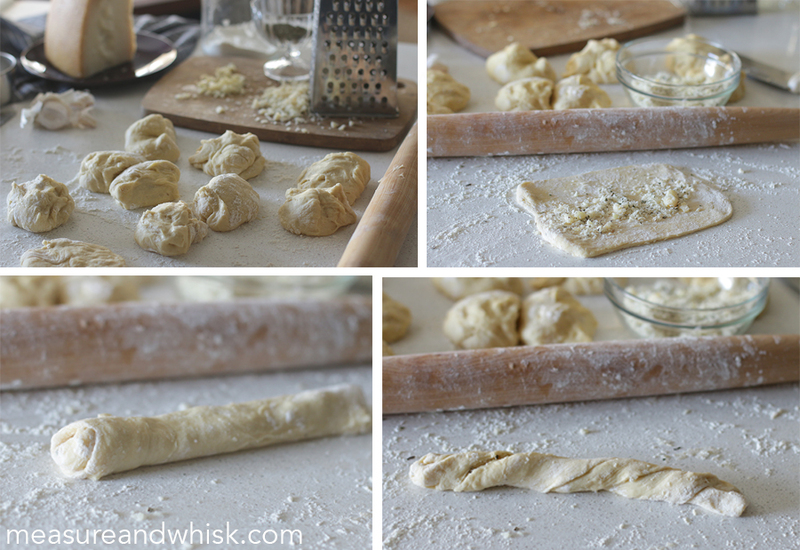 Once your filling is made, and your dough is risen, divide your dough into 12 sections. Dust a clean countertop liberally with flour and roll out each piece of dough into a rectangle that is 8 or 9 inches long about 5 inches wide and about 1/2"-1/4" thick. Brush the dough with butter, then liberally sprinkle with filling, roll up long ways, and with a sharp knife, cut a slash down the from end to end (lengthwise). Twist it (being careful not to dump all the filling out), and tie it in a knot. Place on your prepared mat or baking sheet. Bake in an oven preheated to 350°F for 25 minutes, or until golden brown. Remove and brush with melted butter and sprinkle the top with flaky sea salt. Let cool for 5 minutes, move to a cooling rack and eat immediately! Enjoy! Combine garlic, Parmesan, oregano and salt in a bowl. 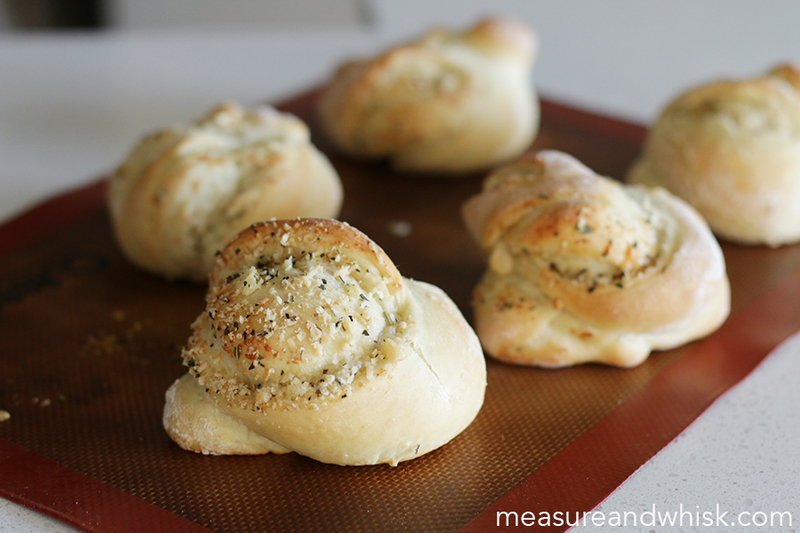 I think I'm going to give these BEAUTIFUL rolls a try for Thanksgiving at Grannie's this year! !